This Roll-Up Drainer Rack is a space-saving kitchen must-have made from silicone-coated steel which also doubles as washing and defrosting station for ingredients. Roll-Up Drainer Rack is the innovative space-saving solution for fast drying the cookware or stemware. Water drips off right into the sink, preventing water buildup on the countertop. 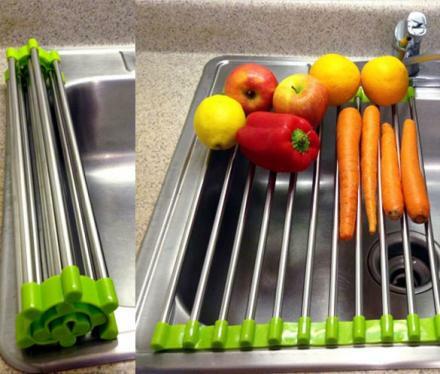 It is great for washing fruits and vegetables or defrost meat. 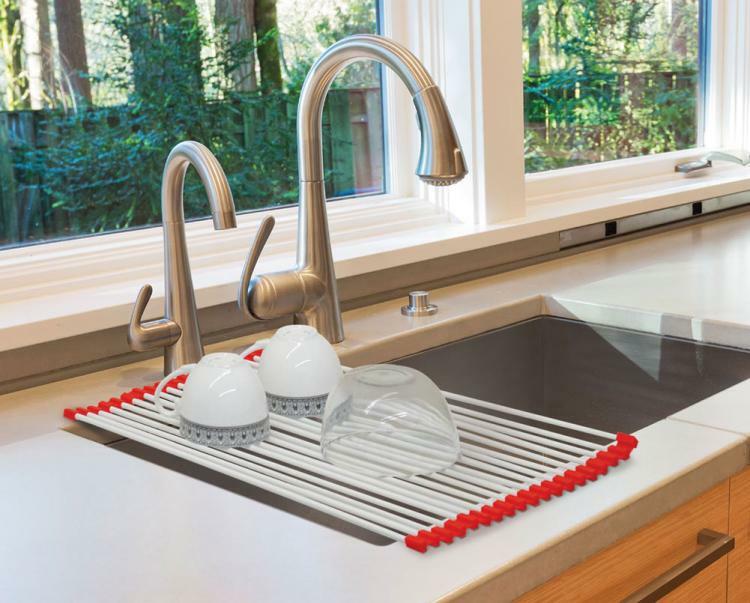 Durable dish rack is heat-resistant to 400 F to serve as an oversized trivet. VERSATILE COUNTER TOP: It can be used as a handy colander for vegetables and fruits, or a wonderful defrosting rack for meat and fish under running water. Water drips off your dishes and straight into the sink, no more watery messes or wasted space on your countertops. 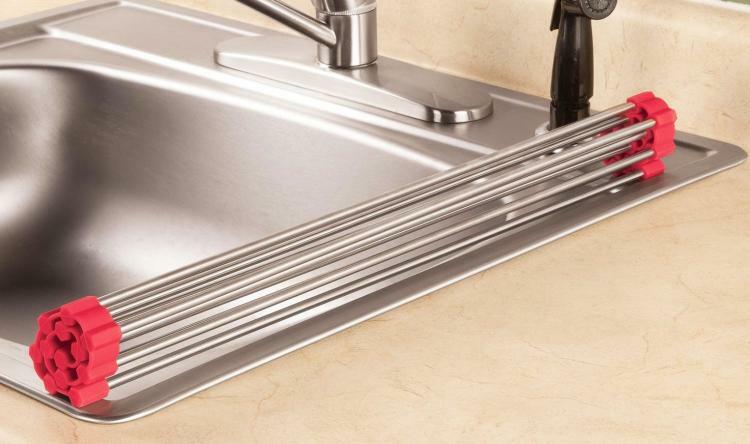 MULTI-PURPOSE: Space-saver over the sink dish drainer for air-drying washed bowls, pot, fry pans, tableware, cookware, cutlery and so on; vegetable colander and prep works platform over the sink. 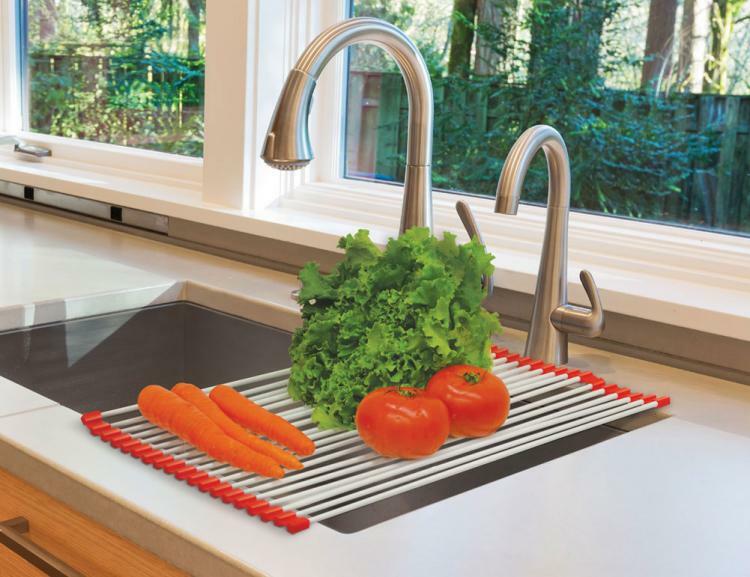 HEAT-RESISTANT: Up to 400°F (204°C), used as a heat resistant trivet mat on the countertop. Size: Small - 37 x 28 CM / Large - 47 x 28 CM. Color: Black / Green / Rose. Material: Stainless steel + silica gel. 1 x Roll-Up Drainer Rack (15 Pipes).